• Dravidian style– This style is worn by Brahmin ladies in Tamil Nadu. • Coorgi style- The pleats are formed in the rear rather than in front and the pallu is worn from back to front on the right shoulder and pined. • Gujarati style– The pallu is brought in front from back on the right shoulder. Learn step by step how to wear Gujarati Saree. • Maharastra style– The lower part is worn in the form of dothi and the upper part is worn on left shoulder. • Bengali style– The pallu is draped twice over the torso and there are no pleats in this style. • Gond style– The pleats are first drapped over the left shoulder and then the body is covered. • Mumtaz style– After the pleats are tucked in waist the remaining fabric is wrapped twice before pulling the pallu over the left shoulder. • Mundum Neriyathum style– This style is common in Kerala. It is essentially two piece sari. One the lower garment and the other is the upper garment. The upper garment can either be wrapped around the chest and tucked inside the blouse or can be worn over the left shoulder. • Tribal style– The sari is tied and secured across the chest. Saree (Sari) is the India’s national dress for females. The word sari is derived from a Sanskrit word ‘sati’ which means ‘strip of cloth’. The literal meaning of sati holds good for sari as it nothing but a piece of unstitched cloth which ranges from 4 yards to 9 yards. 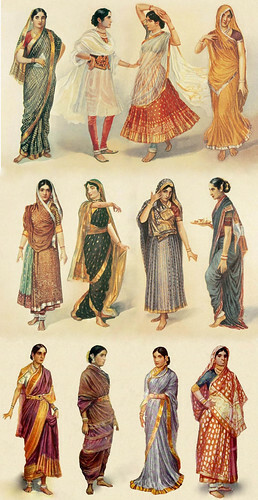 The size of the sari varies because of the different styles that a sari is worn in India. Depending on the style the length of sari required differs. A sari has to be worn with two more essential garments which acts as lining to the main garment i.e. sari. 1) Legenga or the petticoat is the garment worn to cover the body from waist to toes. It has no bodice and it is tightly tied around the waist with the help of a draw string. To this under skirt/petticoat the sari will be tucked. It serves the purpose of holding the sari onto the waist and also acts as opaque underneath garment. It should be chosen to complement the sari that will be draped and should match the colour of the sari. 2) Choli or blouse is the garment worn to cover the upper body which has no midriff and ends just below the bust. The choli needs to be tight fitting and should complement the sari. The blouse is not an undergarment and is seen outside. It can be short sleeved or sleeveless with a range of neck lines. Here I will show you how to wear a sari in a casual fashion. There are different ways of draping the sari which I will mention later. Step 1) Unfold the sari; tuck the least patterned/plain side of the sari inside the petticoat a little right after your naval. See to it that the whole length of the sari lies towards your left. The lower end of the sari should touch the floor after you tuck it. Step 2) Now take the sari that is towards your left and bring it towards your right such that you are wrapped in the sari once. Maintain the height of the sari at the back evenly as in front. Step 3) Hold the sari towards your right and make 5 to 7 pleats of about 5 inch each. Gather together all the plates neatly so that the bottom edge of the sari forms even plates and pin them firmly using a safety pin. Step 4) Tuck the plates inside your petticoat at the center such that they open up towards your left. Steps 5) Now drape the remaining fabric around yourself bringing it from your left to your right. Slightly raise the sari to drape it around your hips. Step 6) Take the rest of the sari and pass it under your right arm and tighten the sari around your waist and hips by pulling the sari over your left shoulder. Step 7) The part of the sari that falls behind your left shoulder to the level of knees or a little below the knees is called the ‘Pallav or Pallu’. You may fasten the pallu with a small safety pin attaching it to the blouse and thus prevent it from slipping down. Or you can even wear the pallu in the pleated form. There are many saree shops in every nook and corner of India. Feel free to pop in and try out the various colours of saris available. Now you know how to wear saree. Once I saw a kind of handbook like thing at airport (probably in Delhi) with hand drawn illustrations. It was probably for the air-hostesses. It had fantastic illustrations. I searched that book at college street many times. Your post reminded me again. A wonderfully well detailed post. I never knew that a sari had so many styles of draping. Amazing! Many thanks for sharing! I love sarees, they are comfy and so colorful. Perfect clothing for warm weather especially. 🙂 that is no good for me ..
Saree is my favorite ethnic wear but I hardly get a chance to wear it, all thanks to modernization! Its so amazing that a piece of cloth can be draped in so many different styles. Wonderful, I will refer to your post when I will wear next time. Thanks! Thanks Saru. Its amazing how many different forms of saree’s are there and not to mention various ways of wearing it. Very interesting – I had no idea there were so many different styles! I swear I an Indian woman in my last life, because I feel very connected to anything I learn about your culture. There are wide range of fashion saris we can find online and as well as in the running market. They have nice competition tough. This is the national dress for Indian women and it is a really beautiful style compared to the other national dresses. One thing that makes it beautiful is the meaning and legends behind the styles to wear them, and there are a lot. Thanks for sharing this interesting article! Sarees are the most beautiul attire for indian women . without a saree any indian women’s attire in incomplete . Thanks for sharing this information that how to wwear saree with us . It will help me alot because i like to wear saree but i don’t know how to drap it . So this is so informative information for me . Great Post…now i believe i can also wear saree after this post…i had strong urge to wear a saree but i didn’t know how to do that…. Hello Suman, for those who are very thin can wear 2 petticoats for chiffon sarees. Those who have wonderful figures don’t need to. Sri Devi was always seen in chiffon sarees as she had a good figure. Remember chiffon sarees are more thinner. Hope this helps. A blog that could even teach a lot of Indians how the sari is worn. Good job. I will come back often to read more. A fantastic tutorial! I’m thrilled that you used pictures as a guide. My fiance will be travelling with me to India within the next few months and she was very curious as to how to wear a saree in the right manner! Loadzzz of saree information..!! I certainly have to mail this link to my friend..She will be delighted. The Saree wearing images of people are looking great, very good collection. Good post! very nice post…thanks a lot for giving Interesting information wearing of saree…..I love saree!!! I would admire you to write some posts for our blog as a guest blogger. Thanks for share the info about how to wear a saree. I have always been impressed with how colorful saris are. Absolutely beautiful. Its very wonderful post. There is lots of information about various types of indian sarees which defines different indian traditional culture as well.The steps of wearing a saree really very helpful. You are going Great Dear,Most of the womens are not aware with this. And it is nice that you are helping them with such a nice articles. +1 this post. What a great informative page about sari. I want to buy one now. Great Share Mam. But feeling sad because our new generation is not giving preference to such clothes. Awesome article I really enjoyed reading this one.very informative.Great Share Mam. But feeling sad because our new generation is not giving preference to such clothes. Good job. I will come back often to read more. Wow! It’s a very nice tutorial. Saree is also a national dress for women in Bangladesh. Thank you for this article. oh well done, i think the sari is one of the attires yet to circulate round the world. I use to see materials pretty much like that of the sari here in Africa but its not yet worn by many because of its cost. But I kind of like the attire and wish i can lay my hands on one. Hey, fantastic post.Thanks for sharing this post.I faced some difficulties in wearing saree but you solved my problem. Sounds very simple, but i agree with shalu sharma’s post, most of us unknown how to wear saree so perfectly. In fact its an indian tradition to tie saree. Thank you so much for sharing us such informative article and putting down what exactly saree is, and pretty we can wear it. i Would like to give a special thanks to share a great knowledge about Sari. This Blog is helping to forward our Indian Traditional culture. Thanks for the amazing post. This Blog is helping to forward our Indian Traditional culture. Hi. this is very useful article for women’s. i like this traditional dresses. because it is awesome. Really a nice description of “How to wear saree”, this is a help to new beginner to wear the sarees in different -different styles. Thank you so much for sharing this nice tips. Hi Shalu ! Before reading this article i had no idea, there were so many different styles. I knew only few saree styles. I love to wear sarees, it comfortable for me and look colorful. But I don’t know how to drape perfectly. Thanks for sharing such a nice information that how to wear saree with us. It will help me a lot and i will try other kind of saree styles also! I was not at all knowing this. Thank shalu sharma for sharing with us a great experience. saree make female more gorgeous than other dresses. i am regular follower of your post . Nice and informative post Shalu. I think many of the ladies do face the issue of wearing a saree many a times especially when they are new to it. For many first timers, it is indeed a very helpful post. Thanks for sharing! Thank you for this step by step guide. I didn’t knew it could be this easy. Keep it up shalu. All Girls are always beautiful when they wear saree. Saree is something traditional look which you need to feel while wearing and also when you see them.